Tottenham travel to Stamford Bridge to face 5th placed Chelsea on Sunday afternoon, looking to stretch their domestic unbeaten run to 13 games. Who will win this London derby? 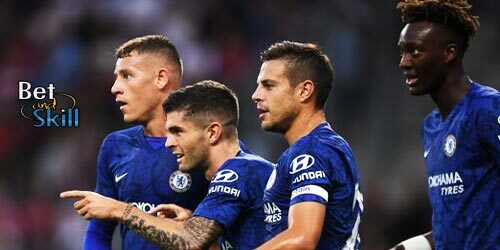 Read below our Chelsea vs Tottenham betting preview with predictions, expert tips, probable lineups, team news, enhanced odds, bookie promotions and no deposit bonuses on Easter Sunday's matches! Chelsea currently sit five points off fourth-placed Spurs. They have recently lost to Manchester United and Manchester City and have only won two of their last six in the league. Actually, Antonio Conte's men have won just seven of 18 matches in 2018, two of those via extra time or penalties. The Blues were also knocked out of the Champions League, losing 3-0 at the Camp Nou against Barcelona. Anyway, they have won nine of their last 11 home matches and are undefeated in their last 22 home matches against Tottenham in all competitions. Antonio Conte has injury problems with David Luiz definitely ruled out while goalkeeper Thibaut Courtois and defender Andreas Christensen are doubts. Willy Caballero and Gary Cahill are their likely replacements should they miss out. Elsewhere, Cesc Fabregas may get the nod over Tiemoue Bakayoko in central midfield, while Willian and Eden Hazard are expected to fill the attacking midfield spots behind the lone striker Alvaro Morata. Olivier Giroud provide a viable alternative up front. Ross Barkley is still not fit and Ethan Ampadu is out for the rest of the season. Tottenham have taken 32 points from the last available 36 in the Premier League and are only three points shy of third-placed Liverpool. They beat Swansea 3-0 at the Liberty Stadium in the FA Cup quarter finals before the international break. Spurs have lost just two of their last 25 matches but were also eliminated in Champions League, suffering a home defeat at the hands of Juventus. As to direct matches against the Blues, Spurs were beaten 2-1 in August's reverse encounter at Wembley. Furthermore, they have lost 18 and won none of their last 27 league visits to Stamford Bridge. Mauricio Pochettino has refused to rule striker Harry Kane out of the clash but Son Heung-Min is expected to replace the England international up front. That should see Lucas Moura or Erik Lamela come into the offensive midfield trio alongside Dele Alli and Christian Eriksen. The likes of Eric Dier and Mousa Dembelè are expected to anchor the midfield, with Victor Wanyama and Moussa Sissoko backup options. In defense, Kieran Trippier and Serge Aurier compete for a spot at right-back, while Ben Davies is expected to keep Danny Rose on the bench on the opposite flank. Get 25/1 Chelsea to win vs Tottenham with Paddy Power! New Customers can get Chelsea at an enhanced 25/1 to beat Tottenahm or Tottenham to beat Chelsea at 40/1. Max Stake £1. Winnings paid in free bets, valid for 7 days, only deposits with cards/Paypal count. Exchange and multiple bets excluded. T&C’s Apply. 18+|Gamble Aware. Placing your bets at the best odds around is one of the keys for the success. Find below the highest prices on the Chelsea vs Tottenham match winner market! Don't miss our today's football tips! You can also Follow us on Twitter!! 25/1 Chelsea or 40/1 Spurs! Get 25/1 Chelsea to beat Tottenham or 40/1 Spurs to win with Betfair! New Customers can get Manchester City at an enhanced 25/1 to beat Everton. Max Stake £1. Winnings paid in free bets, valid for 7 days, only deposits with cards/Paypal count. Exchange and multiple bets excluded. T&C’s Apply. 18+|Gamble Aware. The following tips are recommended by BetAndSkill's professional tipsters! Feel free to copy our free predictions on Chelsea vs Tottenham! You can combine them all in a multiple bet via a request a bet service. Please visit also our bookmakers' odds comparison table and today's enhanced odds sections in order to get the best available bargains! Wanna read more Premier League match previews? We suggest you to visit our brand new Premier League free tips section! "Chelsea vs Tottenham predictions, betting tips, lineups and odds (Premier League - 1.4.2018)"